The House of Valois-Burgundy (French: Maison de Valois-Bourgogne), or the Younger House of Burgundy, was a noble French family deriving from the royal House of Valois. It is distinct from the Capetian House of Burgundy, descendants of King Robert II of France, though both houses stem from the Capetian dynasty. 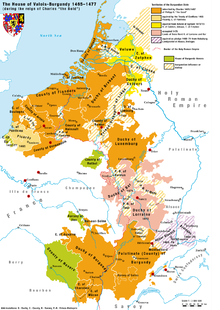 They ruled the Duchy of Burgundy from 1363 to 1482 and later came to rule vast lands including Artois, Flanders, Luxembourg, Hainault, the county palatine of Burgundy (Franche-Comté), and other lands through marriage. The term "Valois Dukes of Burgundy" is employed to refer to the dynasty which began after King John II of France granted the French Duchy of Burgundy to his youngest son, Philip the Bold in 1363. During the Hundred Years' War, the dukes rivalled with their royal cousins uniting a great number of French and Imperial fiefs under their rule. However, their plans to establish an autonomous kingdom ultimately failed when the last duke, Charles the Bold, sparked the Burgundian Wars and was killed in the Battle of Nancy in 1477. The final ruler of the dynasty, Mary, Duchess of Burgundy, attempted to assert her authority within her domains, but failed. Her lands outside of France passed to her eldest son, Philip, to become the Habsburg Netherlands, while the Duchy of Burgundy itself returned to the kingdom of France. Mary died in 1482, thus ending the House of Valois-Burgundy. The former Frankish Kingdom of Burgundy had been divided into an East and West Frankish part by the 843 Treaty of Verdun. While the eastern part evolved to the Kingdom of Arles and the Free County of Burgundy, incorporated into the Holy Roman Empire in 1032, the western Duchy of Burgundy, established about 918 by Richard the Justiciar, became a fief of the French royal House of Capet under King Robert II in 1002. To meet the demands of the Burgundian nobles for autonomy, King Robert installed his second son Henry as Duke of Burgundy about 1016, a title that passed to his younger brother Robert I and his descendants after Henry had succeeded his father as King of France in 1031. The Capetian House of Burgundy became extinct when Duke Philip I died in 1361, before he was able to consummate the marriage with Margaret of Dampierre, heiress of Count Louis II of Flanders. 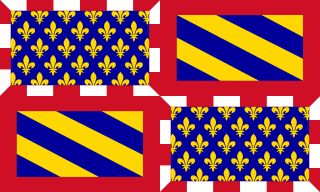 The Duchy of Burgundy was then unified with the French royal domain under the Valois king John II. Soon after, however, John's fourth son Philip the Bold received the Duchy of Burgundy as an appanage from the hands of his father. Philip the Bold ruled as Duke Philip II of Burgundy from 1363 to 1404. In 1369 he himself married the widowed Margaret of Dampierre, and when his father-in-law Count Louis II of Flanders died in 1384, he succeeded him not only in the French counties of Flanders, Artois, Rethel, and Nevers, but also in the Free County of Burgundy, becoming a direct vassal of the Holy Roman Emperor. The next year he arranged the double wedding of his son and heir John the Fearless with Margaret of Wittelsbach, daughter of Duke Albert of Bavaria-Straubing and sister of Prince William II of Bavaria, who himself married Philip's daughter Margaret. Already upon the death of King Charles V of France in 1380, Philip together with Duke Louis I of Anjou and Duke John of Berry had acted as regent for his minor son King Charles VI. As Charles VI suffered from increasing mental derangement, Philip tried to spread his influence across the French kingdom, which met with the fierce resistance by the king's younger brother Duke Louis I of Orléans. Raised in Flanders, Duke John the Fearless succeeded his father in 1404 and unified the heritage of his mother Margaret of Dampierre with the Burgundian duchy. Ceding the French counties of Nevers and Rethel to his younger brothers Philip II and Anthony, he began a skilful see-saw policy to create a scope for free action while the French lands were ravaged by the Hundred Years' War against the Kingdom of England. Like his father he quarrelled with his Valois cousin Louis I of Orléans, whom he had assassinated in 1407. The remaining tensions with the Orléans liensmen led to the French Armagnac–Burgundian Civil War, whereby Duke John allied with King Henry V of England and in 1418 occupied Paris, but was lured into an ambush and murdered by the Armagnac leader Tanneguy du Chastel the next year. 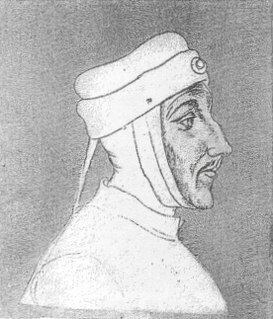 John's son Philip the Good, Duke of Burgundy from 1419, renewed his father's alliance with King Henry V of England when he signed the Treaty of Troyes in 1420 against the French Dauphin Charles VII. He first concentrated on enlarging the Burgundian territories, acquiring the succession in the Imperial County of Namur in 1421 (with effect from 1429) and succeeding his cousin Duke Philip of Saint-Pol in the Imperial duchies of Brabant and Limburg. He also secured the Bavaria-Straubing heritage of his mother Margaret of Wittelsbach and his uncle Duke John III of Bavaria-Straubing, when finally in 1433 the last Straubing heiress Jacqueline ceded the Imperial counties of County of Hainaut (Hennegau), Zeeland, and Holland, as well as Frisia to him. By the 1435 Congress of Arras Duke Philip acknowledged the rule of King Charles VII of France and in turn reached the formal independence of the Burgundian lands from the French Crown. In 1441 he also purchased the Duchy of Luxembourg from the last duchess regnant Elisabeth of Görlitz. The Valois-Burgundy duke Charles the Bold, ideal picture of a knightly duke, wore himself out in armed conflicts. With the acquisition of Guelders, the Burgundian Netherlands reached their greatest extent. Charles' plans to accomplish the rise of his dynasty peaked in the negotiations with the Habsburg emperor Frederick III about his elevation to a "King of Burgundy" and the marriage of his daughter Mary to Frederick's son Archduke Maximilian of Austria. Enraged at the reluctance of the emperor, Charles started the unsuccessful Siege of Neuss in 1474 and became involved in the Burgundian Wars against the Duchy of Lorraine and the Swiss Confederacy. In consequence, the Valois-Burgundy dukes became extinct in the male line when Charles was killed in the 1477 Battle of Nancy. The Burgundian heritage passed to the Habsburg archduke Maximilian, who married Mary of Burgundy seven months after her father's death and could ward off the claims raised by King Louis XI of France in the 1479 Battle of Guinegate. The French king could only seize the Duchy of Burgundy proper, Artois, and the former Burgundian fiefs in Picardy. The House of Habsburg abruptly rose to a royal dynasty of European scale, however, at the price of the centuries-long France–Habsburg rivalry. Philip the Bold 1363–1404 Fourth son of King John II of France from the House of Valois and his wife Bonne of Luxembourg. Married Countess Margaret III of Flanders in 1369. John the Fearless 1404–1419 First-born son of Philip the Bold. United the heritage of his mother with Burgundy. Married Margaret of Bavaria in 1385. Charles the Bold 1467–1477 Only legitimate heir of Philip the Good and his third wife Isabella of Portugal. Last Valois duke of Burgundy, killed in the Battle of Nancy. Mary 1477–1482 Only child of Charles the Bold and his second wife Isabella of Bourbon, married the Habsburg archduke Maximilian I of Austria in 1477. The Seventeen Provinces were the Imperial states of the Habsburg Netherlands in the 16th century. They roughly covered the Low Countries, i.e. what is now the Netherlands, Belgium, Luxembourg, and most of the French departments of Nord and Pas-de-Calais (Artois). Also within this area were semi-independent fiefdoms, mainly ecclesiastical ones, such as Liège, Cambrai and Stavelot-Malmedy. The Free County of Burgundy was a medieval county of the Holy Roman Empire, within the modern region of Bourgogne-Franche-Comté, whose very name is still reminiscent of the title of its count: Freigraf. It should not be confused with the more westerly Duchy of Burgundy, a fiefdom of Francia since 843. The Duchy of Burgundy emerged in the 9th century as one of the successors of the ancient Kingdom of the Burgundians, which after its conquest in 532 had formed a constituent part of the Frankish Empire. Upon the 9th-century partitions, the French remnants of the Burgundian kingdom were reduced to a ducal rank by King Robert II of France in 1004, and in 1032 were awarded to his younger son Robert per Salic law – other portions had passed to the Imperial Kingdom of Arles and the County of Burgundy (Franche-Comté). The County of Hainaut, sometimes given the spelling Hainault, was a historical lordship within the medieval Holy Roman Empire with its capital eventually established at Mons, and named after the river Haine, both now in Belgium. Besides Mons, it included the city of Valenciennes, now in France. It consisted of what is now the Belgian province of Hainaut and the eastern part of the French département of Nord. Charolais is a historic region of France, named after the central town of Charolles, and located in today's Saône-et-Loire département, in Burgundy. The Burgundian Wars (1474–1477) were a conflict between the Dukes of Burgundy and the Old Swiss Confederacy and its allies. Open war broke out in 1474, and in the following years the Duke of Burgundy, Charles the Bold, was defeated three times on the battlefield and killed in the Battle of Nancy in 1477. The Duchy of Burgundy and several other Burgundian lands then became part of France, while the Burgundian Netherlands and the Franche-Comté were inherited by Charles's daughter Mary of Burgundy, and eventually passed to the House of Habsburg upon her death because of her marriage to Maximilian I, Holy Roman Emperor. In the history of the Low Countries, the Burgundian Netherlands were a number of Imperial and French fiefs ruled in personal union by the House of Valois-Burgundy in the period from 1384 to 1482 and later their Habsburg heirs. The area comprised large parts of present-day Belgium and the Netherlands, as well as Luxembourg and parts of northern France. The Treaty of Arras was signed at Arras on 23 December 1482 by King Louis XI of France and Archduke Maximilian I of Habsburg as heir of the Burgundian Netherlands in the course of the Burgundian succession crisis. Louis II of Flanders, also known as Louis of Male, a member of the House of Dampierre, was Count of Flanders, Nevers and Rethel from 1346 as well as Count of Artois and Burgundy from 1382 until his death. The Burgundian Circle was an Imperial Circle of the Holy Roman Empire created in 1512 and significantly enlarged in 1548. In addition to the Free County of Burgundy, the Burgundian Circle roughly covered the Low Countries, i.e., the areas now known as the Netherlands, Belgium and Luxembourg and adjacent parts in the French administrative region of Nord-Pas-de-Calais.